BMW X5 xDrive30d M Sport is the top diesel variant in the X5 lineup and is priced at Rs. 82.90 lakh (ex-showroom, Delhi). This base variant comes with an engine putting out 258bhp@4000rpm and 560Nm@1500-3000rpm of max power and max torque respectively. The gasoline motor comes mated to 8 Speed Automatic transmission which is quite a joy to use. BMW claims an average of 16 kmpl for this top xDrive30d M Sport variant. In Car Entertainment (Audio) : "BMW Apps, Harman Kardon Surround system, iDrive Touch with handwriting recognition, DVD drive and integrated hard drive (20 GB) for maps and audio files, 3D maps, 26cm LCD screen, Configurable user interface, Resolution of 1440 x 540 pixels, xDrive status with compass function,, CD Player, DVD Player, FM/AM/Radio, Speakers Front and Rear, Integrated 2DIN Audio, Bluetooth Connectivity, USB and Auxiliary input, Touch Screen, Apple Carplay "
Share your experiences with X5? We do a detailed spec comparison of the all-new Volvo XC90 with its most fierce competitors, the Mercedes-Benz GL-Class, the BMW X5, the Audi Q7 and the Land Rover Discovery. 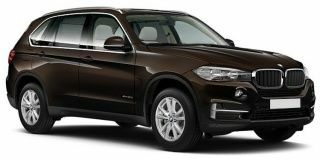 Let's face it, we've always liked the BMW X5, and when the company ushers in an all new model, we just couldn't wait to get our hands on it both on road and off it! Vikram Gour puts the new X5 xDrive30d through its paces to bring you these driving impressions?